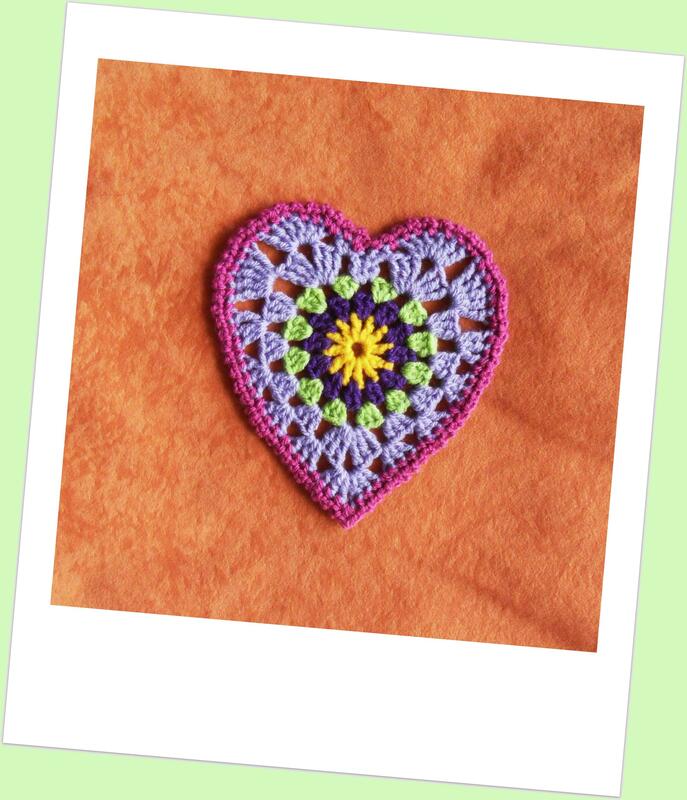 I found this nice Sunburst Granny Hearts pattern by Bunny Mummy while I was surfing on the net. 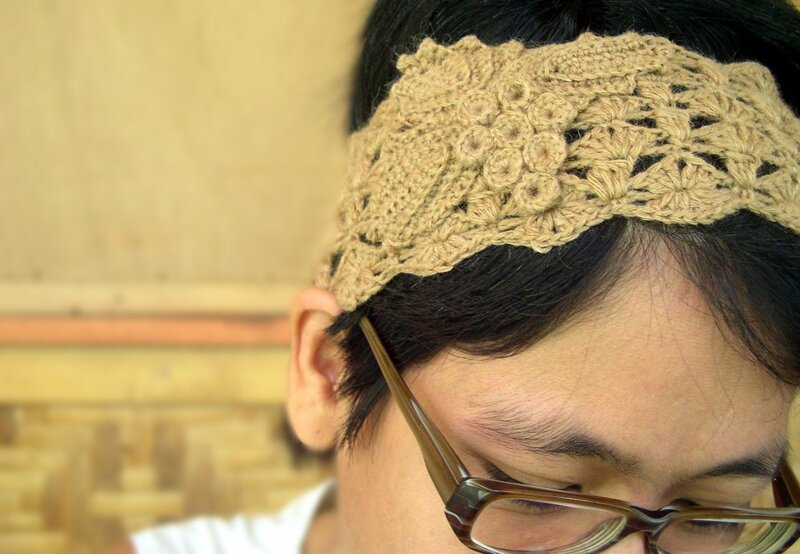 I tried it straight away and it was easy to follow and crochet in no time. I only added the outer edge to it (sc, ch2, all around it). 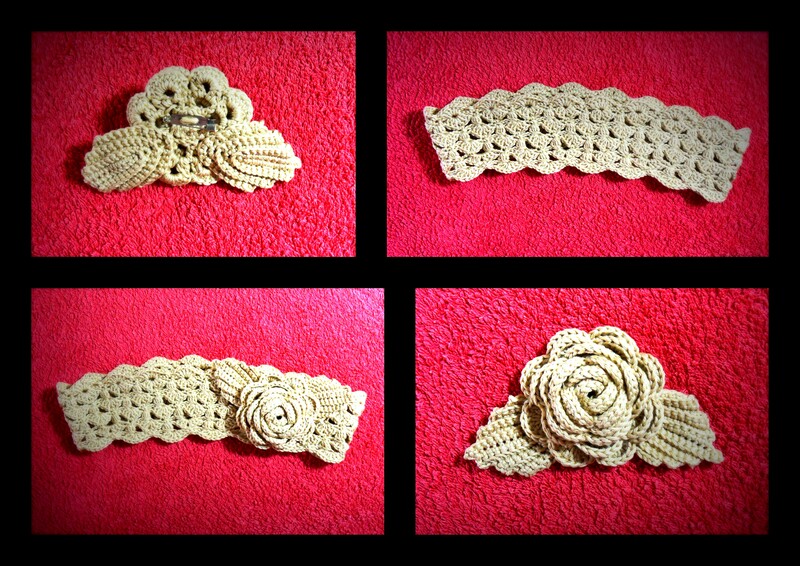 Instead of the grapes I made the rose brooch so I can war the headband with or without the flower. I used 100% Mercerized Cotton and a 2,5mm Hook. 31 grams for the headband and 19 grams for the rose. 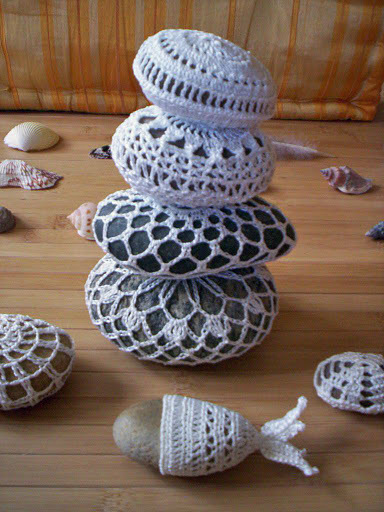 I totally love crochet covered rocks. 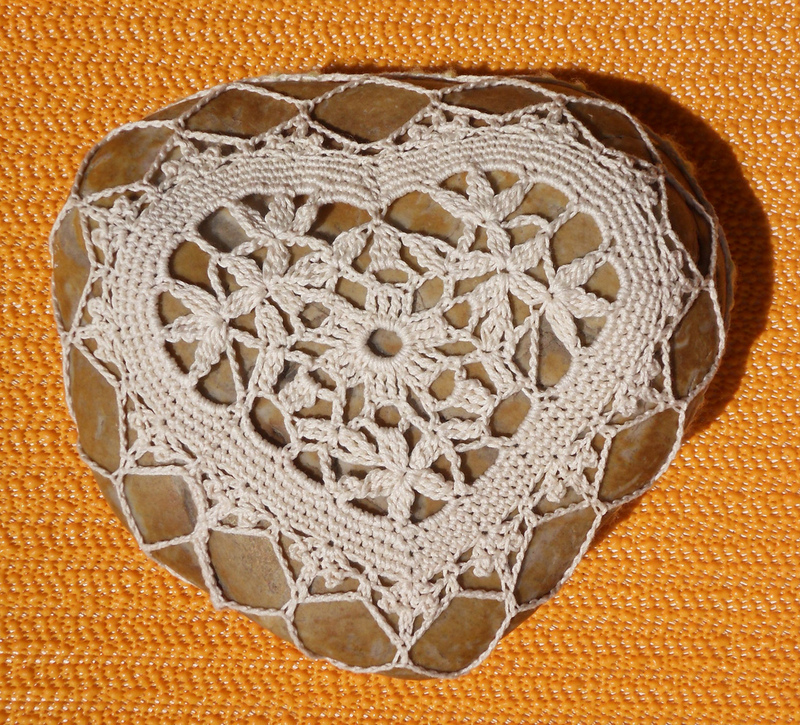 I think the contrast between the hard cold stone and the soft warm yarn is great. The first covered rocks I saw where the ones from http://www.resurrectionfern.typepad.com/ . 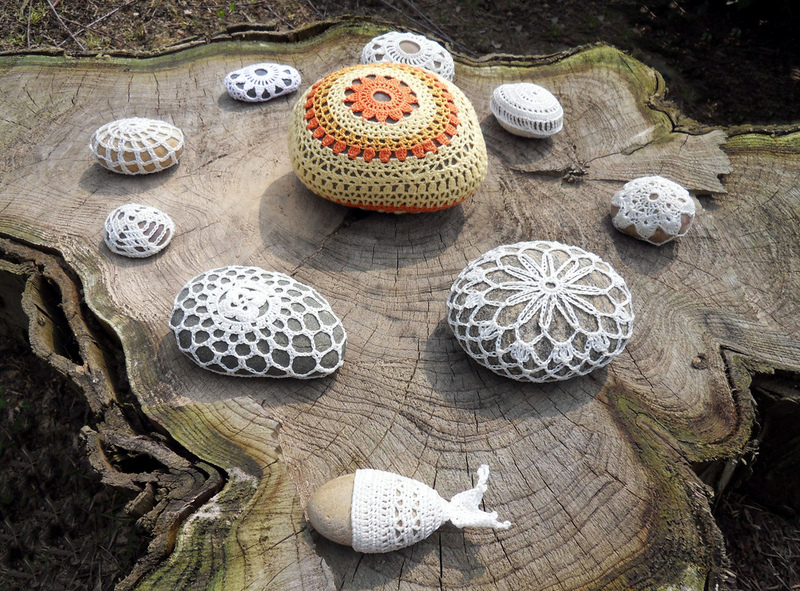 She creates such beautiful things with materials she finds in nature. 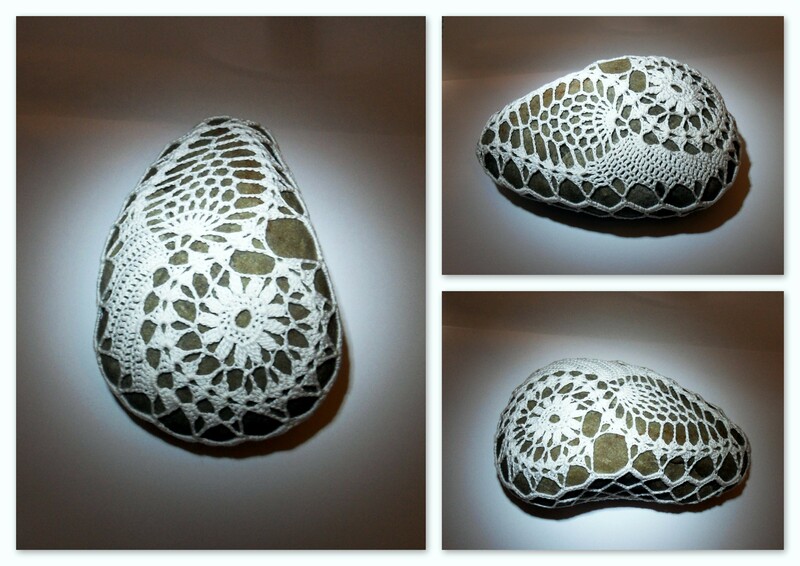 Inspired by her rocks I started hunting for pictures and ideas on the net. 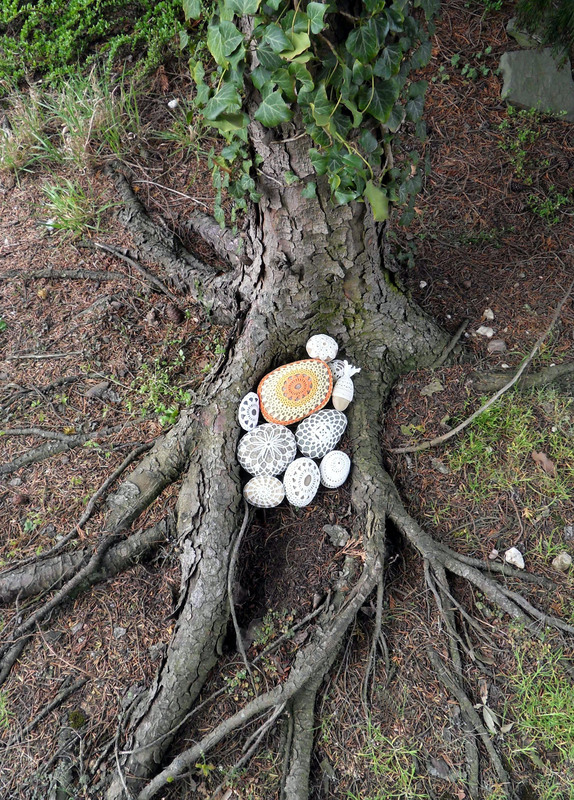 In the meantime a lot of people discovered the joy of creating Rock Art. 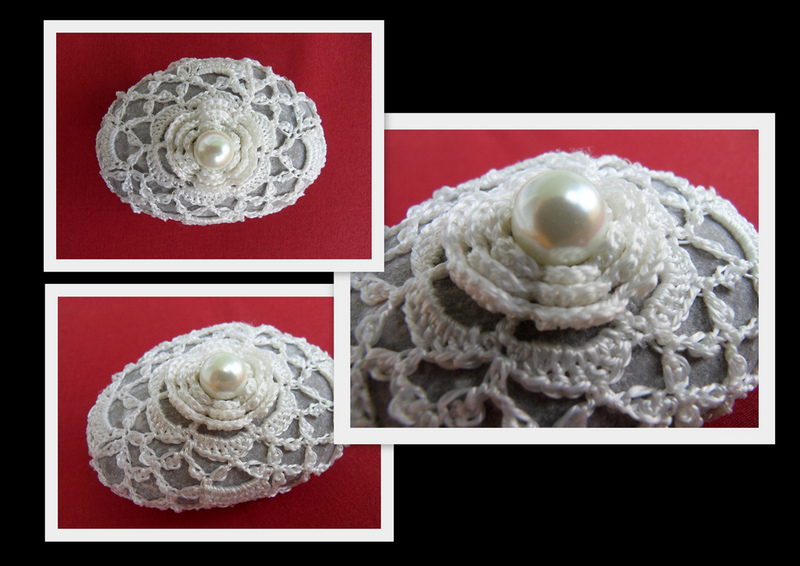 No matter if they are made with white thread (which looks really elegant) or multicolored. I love them all. 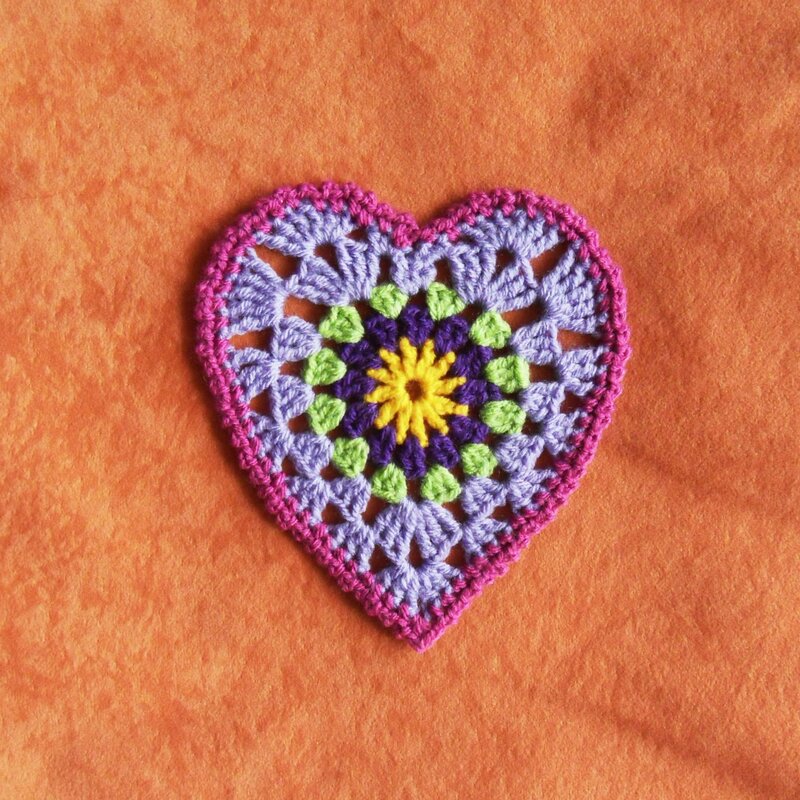 This one I copied from a doily picture I found on the internet. This is the biggest stone so far. It nearly weighs 3 kg and measures 20×18 cm. It´s quite big and I use ist as a doorstop sometimes. 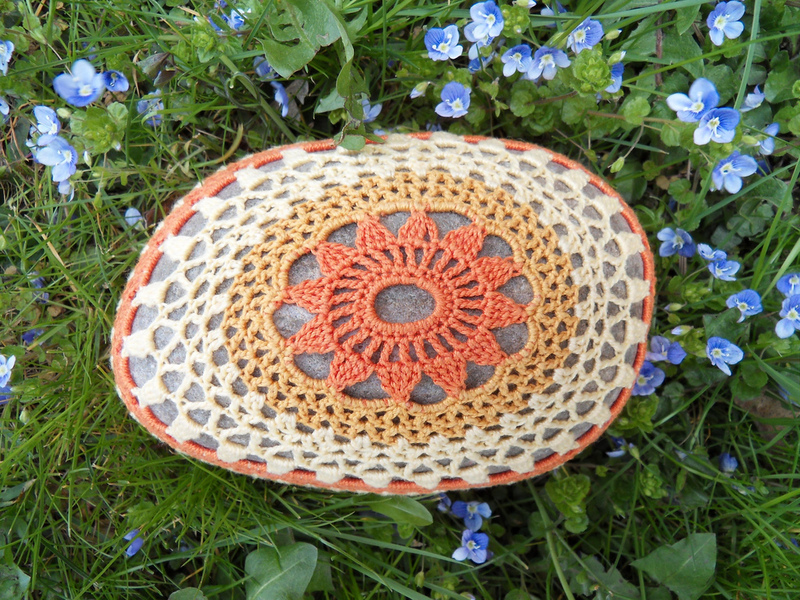 This one is an adapted irish crochet doily. 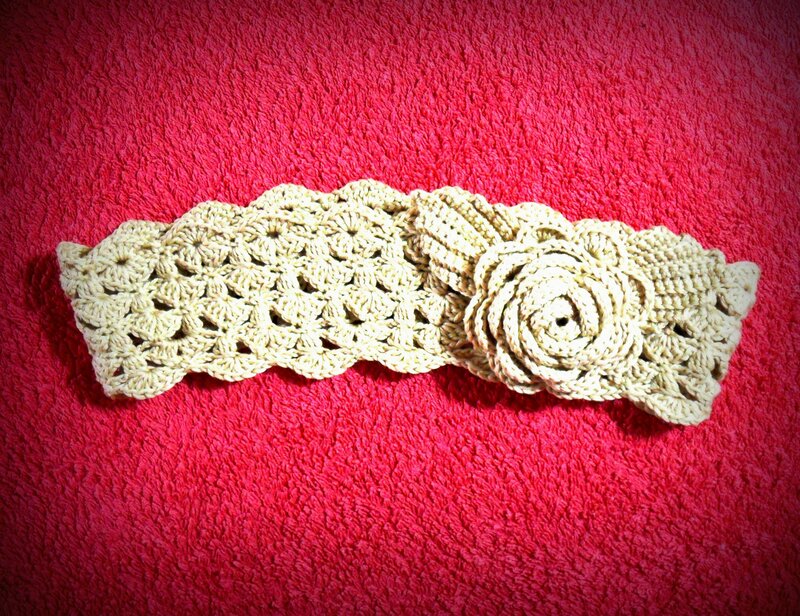 I added a big bead in the middle of the irish rose pattern to make it look more elegant. I hope you like what you see and maybe you are inspired to try it yourselft. 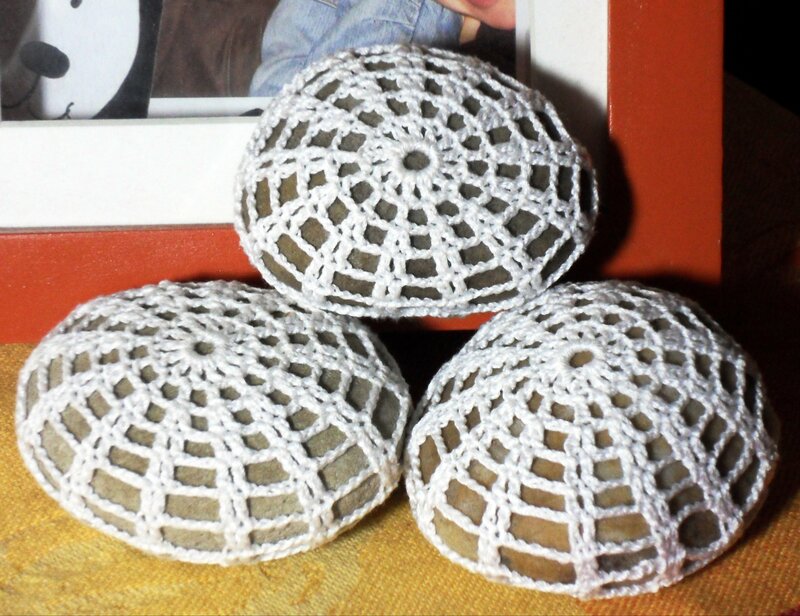 Purlbee has a nice tutorial posted if you want to (http://www.purlbee.com/little-urchin-crochet-covered/). 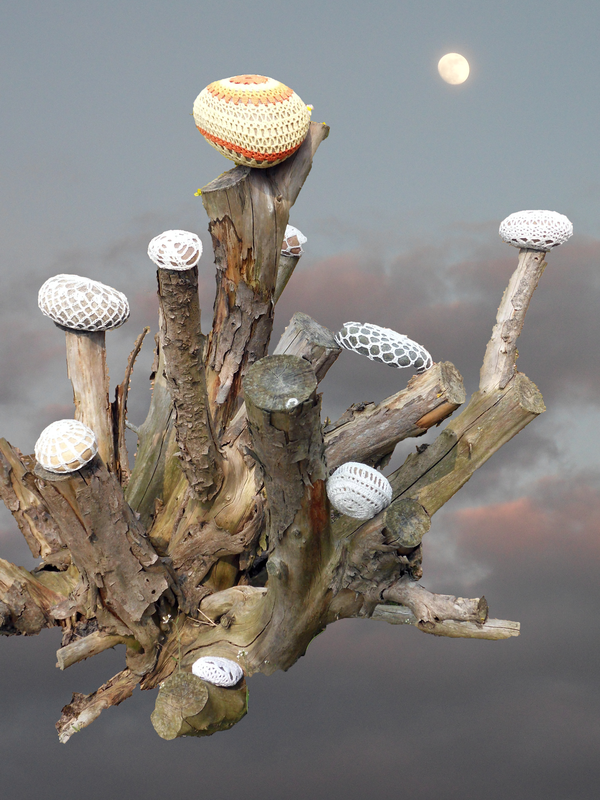 There are endless possibilities to create and have fun.